June 30, 2014, 6:18 p.m.
Last week, we wrote about @ReplayLastGoal, a Twitter account that automatically tweets out a GIF and a video of each goal scored in the World Cup. Great idea! Interesting execution! But also a copyright violation, at least according to FIFA, the governing body that runs the World Cup. Early Saturday morning, @ReplayLastGoal tweeted a screenshot of an email from Twitter informing Xavier Damman, the account’s creator, that FIFA had filed a request asking Twitter to remove the account for copyright violation. Its Facebook page has also been removed. All of @ReplayLastGoal’s tweets from before the takedown notice have been removed — but the account keeps tweeting out new goals. Damman is also a cofounder of Storify, so he appropriately created a Storify of Twitter users urging FIFA to allow @ReplayLastGoal to continue. @ReplayLastGoal isn’t the only account having problems with World Cup copyright violations. SB Nation has had two Vine accounts that showcased six-second videos of World Cup goals deleted, The Wall Street Journal reported. ESPN and Univision, which own the broadcast rights to the Cup in the United States, have been vigilant in trying to eradicate unofficial World Cup videos and GIFs, the Journal reported. 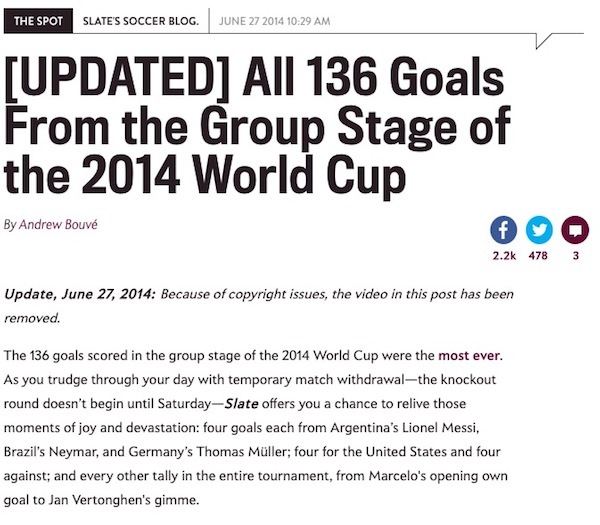 Slate, for instance, created a video showcasing the first 136 goals of the World Cup. Lichterman, Joseph. "FIFA has cracked down on that World Cup Twitter bot (and other people tweeting and Vining and GIFing goals)." Nieman Journalism Lab. Nieman Foundation for Journalism at Harvard, 30 Jun. 2014. Web. 25 Apr. 2019. Lichterman, Joseph. "FIFA has cracked down on that World Cup Twitter bot (and other people tweeting and Vining and GIFing goals)." Nieman Journalism Lab. Last modified June 30, 2014. Accessed April 25, 2019. https://www.niemanlab.org/2014/06/fifa-has-cracked-down-on-that-world-cup-twitter-bot-and-other-people-tweeting-and-vining-and-gifing-goals/.